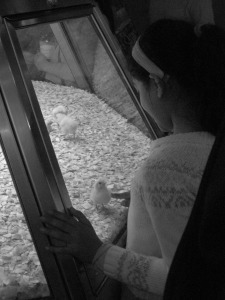 At the Chicago Museum of Science and Industry, a young girl has a connection with a newly hatched chick. In this exhibit, chicken eggs are incubated on one side of a divider while on the other side, newly hatched chicks are free to roam. This was by far one of the most popular exhibits I saw, children and adults alike loved to watch as tiny lives entered this world and took their first steps. For many children who grow up in the city, this may be the first time they have had such a close look at the beginnings of another creature’s life.